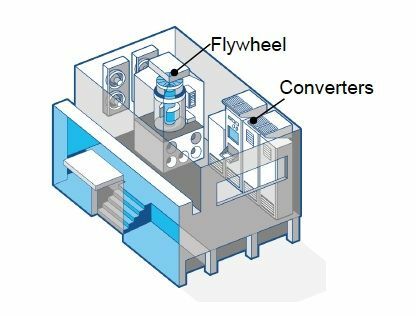 Can one combo flywheel-inverter device solve multiple microgrid challenges? Modern grids rely on many different resources to stabilize the electricity they carry. But in simple terms, let’s separate them into two main types: those that have “inertia” and those that don’t. Spinning resources like turbines and generators have inertia, meaning that they slow down and speed up in ways that directly interact with and improve the stability of the electrical system. Solar and wind power inverters lack inertia, and while they can be programmed or controlled to perform certain grid-balancing tasks, they just don’t provide the same stability as spinning metal, magnets and wire. This can be a significant problem for microgrids -- self-contained systems of power generation, distribution and end loads. Microgrids tend to rely on diesel generators or small-scale turbines as their spinning resources, but would like to add more renewables to their systems. But the more they add, the more they rely on the uncertain ups and downs of wind and sun-generated power, all coming from inverters that lack the inertial stability that comes from spinning generators. This can quickly add up to system-wide instability that can force generators to ramp up and down wildly, push grid protection gear into states it’s not meant to handle, or force the wind and solar to shut off altogether. Swiss grid giant ABB believes it has an answer to this challenge in PowerStore, a grid stabilizing generator that combines the inertial properties of a flywheel, the power management functions of advanced inverters, and the software to make it all work together. Think of it as an entire grid’s worth of generators, power electronics and control systems, shrunk to the size of a cargo container, that can push the practical penetration of renewable power from around 15 percent to 20 percent, to as high as 100 percent. 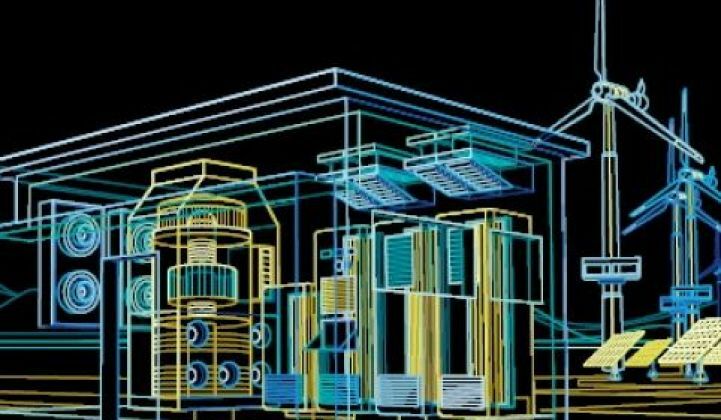 That sounds like a bold claim, but according to Brad Luyster, vice president and general manager of ABB’s microgrid business, that’s exactly what many of the systems using PowerStore are handling today. Of course, it’s rare to see sun and wind power completely supply a microgrid’s power needs, so those systems fluctuate between 100 percent and as low as 40 percent renewable energy through the course of a day, or a year. Through it all, “PowerStore is the voltage and frequency supplier,” he said, keeping supporting diesel generators from “hunting” up and down, or grid protection gear from tripping on and off, in a vain attempt to balance out fluctuations. The flywheel at the heart of the system is “a spinning mass that requires very little maintenance, and a high duty cycle,” with the ability to react within 5 milliseconds, far faster than diesel generators can be fired up or down. The inverters, in turn, can inject or absorb real or reactive power in ways that help match the characteristics of inverter-supplied renewable energy. Orchestrating it all is ABB’s renewable microgrid controller (RMC) software, which monitors and manages both renewable and fossil fuel-fired generators. ABB has installed PowerStore devices in a dozen microgrids across the world today, Luyster said. Those account for a collective 3 megawatts of power management, and another 2.1 megawatts are under commissioning, according to a March presentation (PDF). The earliest deployments are in Australia, where Powercorp, the developer of the PowerStore technology, used them to integrate wind power into diesel generator-powered remote grids. ABB started working with the technology in 2006, and bought Powercorp in 2011 for an undisclosed sum. Other off-grid systems in Alaska and the Antarctic, and several island grids, including one in the Azores, round out the mix. Diesel-dependent remote or island grids remain the most economically attractive setting for microgrids, since they’re reliant on expensive imported fuel, which makes the payback on investing in renewables come more quickly. At an installed cost of about $1.5 million to $2 million, the PowerStore device comes in at about 10 percent of the cost of the microgrids they’re enabling, which generally fall into the range of 5 to 10 megawatts of capacity, he said. But PowerStore can also play a valuable role in grid-connected microgrid systems, he said. ABB has one project with Canadian utility Hydro Quebec that’s using the device to balance about 6 megawatts of wind on a 45-megawatt grid, he said. Beyond that, ABB is looking into about 10 different grid-connected, or “embedded,” microgrid projects across the United States, he said. These are focused on providing the on-site power reliability to allow independent generation and load to keep running when the grid goes down. Take the example of a data center, which already has emergency backup generators and uninterruptible power supply (UPS) systems, but also wants to keep other resources, like combined heat-and-power (CHP) systems or rooftop solar panels, running during an outage. Today, that’s not really possible without the guidance of the grid’s frequency and voltage for those systems to run against, he said. But with PowerStore in place, “We energize the grid,” allowing those systems to keep running. That could allow a data center to skip the step of setting up an entire, parallel emergency backup system, as well as the switching systems to move from grid power to off-grid power, and replace it with a single standalone system -- and that, in turn, could save lots of money, and allow inverter-based renewables to keep pumping power to that system through emergencies. “We’re just in the midst of doing this with a couple of customers,” he said. Those include several projects in Connecticut, a state that’s pushing microgrid development in the wake of Hurricane Sandy to keep key community assets powered after major storms. It’s also working on a proof-of-concept project with giant U.S. utility Duke Energy, centered on a mixed-use residential and commercial development surrounding a newly built community college campus, he said. The idea there is to show Duke how providing critical power and integrating local renewable energy could help the utility by reducing the costs of serving that community with the array of grid resources that PowerStore could provide instead. The United States has nearly 1,500 megawatts of generation operating in microgrids, according to the Rocky Mountain Institute. But almost all of those projects aren’t set up to be an integrated utility resource -- although projects like San Diego Gas & Electric's Borrego Springs microgrid serve as noteworthy exceptions to that rule. There’s quite a debate over whether microgrids represents an existential threat to utility business models, as yet another step in detaching customers from the grid power that utilities sell. But for the vast majority of customers, the utility grid is still absolutely necessary to keep stable and plentiful power flowing. At the same time, the rise of distributed renewable generation, on-site energy storage systems, sophisticated building energy management systems and other grid-edge technologies are putting utilities under stress to keep serving that role. Microgrids could play a valuable part in smoothing the transition to a decentralized, yet still secure grid.